A question that has been on everyone’s minds has been confirmed… Tokens can be used for Link Summoning! And Trap monsters too, if thats something you care about. Also updated on rulings for Mind Control! Q: If you revive an Extra Deck Monster which has been properly summoned with “Monster Reborn”, which Zone do you put them in? A: That monster will be placed in a Main Monster Zone. You cannot special summon them to the Extra Monster Zone. Q: If you activate “Mind Control” on an opponent’s monster that is in the Extra Monster Zone, which zone do you place that monster in? A: That monster will be placed in the Main Monster Zone of the player that activated “Mind Control”. Also when control of that monster is returned to the opponent, that monster will be placed in the opponent’s Main Monster Zone. Q: Can Tokens and Trap Monsters be used as materials for Link Summoning? 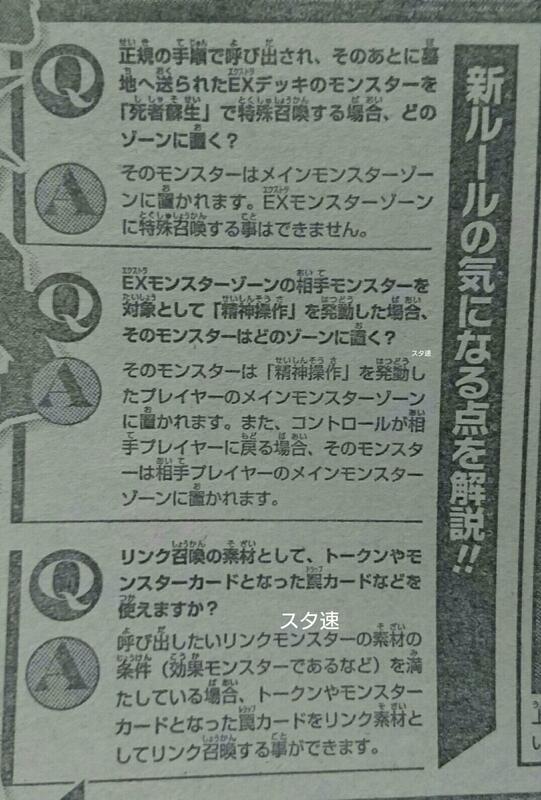 A: If they meet the requirements of the materials needed for the Link Monster (Such as requiring Effect Monsters), Tokens and Trap Monsters can be used as materials for Link Summoning. I think you can’t use scapegoat for link summoning because scapegoat says the tokens can’t be used for tribute.so I think until now it isn’t clear if tributing for a link monster is considered tributing.